When Martine LeDuc, publicity director for the city of Montréal, is summoned into the mayor’s office, she’s pleasantly surprised to find the city is due for a PR coup: a doctoral researcher at McGill University claims to have found proof that the British crown jewels were stored in Montréal during WWII. Martine is thrilled to be part of the excavation project, until it turns out that the dig’s discoveries include the skeleton of a man with diamonds in his ribcage and a hole in his skull. Is this decades-old murder leading her too far into the dangerous world of Canada’s neo-Nazi networks, or is there something going on that makes the jewels themselves deadly? Is history ever really completely buried? With pressing personal issues crowding into her professional life, Martine needs to solve not only the puzzle of the jewels, but some more recent crimes—including another murder, a kidnapping, and the operation of an ancient cult in Montréal—and do it before the past reaches out to silence her for good. Like its predecessor, Asylum, this novel was inspired by stories about Montréal's past. This time I was curious about the British crown jewels having been stored in Montréal during the second world war… and from that I devised a plot in which to entangle my present-day protagonist, her stepkids, and a couple of people with very dark secrets. I talked about Martine LeDuc when I was writing about Asylum here on Bookgoodies. I will say that as a stepmother myself, I wanted to write about that aspect of relationships (it's harder than it looks, and it looks hard! ), so I gave Martine a husband with two children from a prior marriage. 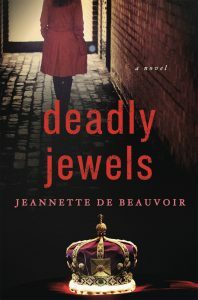 In Deadly Jewels the children have come to live permanently with Martine and Ivan, so in the midst of solving this mystery she also has to cope with their very real issues. I watched as he started distributing maps of the city to the other Gray Line passengers. While all of Canada is supposedly bilingual, Québec’s first language is officially French, and here in Montréal there’s always the question. Go into a shop, and they’ll say, “Hello-bonjour,” all in one breath, and wait to see how you respond. In which flavor, so to speak. But while tourists come in all shapes, sizes, and languages, most of the people sitting on the bus with me were part of a group that had just gotten off the cruise ship docked out on the waterfront, tremendous and a little overpowering on the St. Lawrence Seaway skyline. Americans, all of them. The guide handed me my map with nothing more than an impersonal friendly smile, and I was glad: what I didn’t need was to be recognized and have anything on the tour changed or adapted because I was there. I’m the directrice de publicité—the publicity director—for the city of Montréal, and the tourism people tend to be a little touchy about my treading on their perceived territory. Most of the time we’re able to play well together, but it’s a tenuous relationship with plenty of opportunities for faux pas and worse. I try and take the Gray Line excursions at least once a year, both the half-day tour of Montréal that I was on now and the full-day expedition that goes to Québec City. It would be easy, in my job, to just sit in my office down in the Old City and handle problems, soothe ruffled feathers, solve perceived, potential, and real crises, and leave every day with a headache the size of Manitoba—and that isn’t what I signed on for. Taking the sightseeing tour reminds me of all the reasons I’m really here. The history of my city; its diversity, its cultural riches, its urban pulse, its amazing cuisines, all of that gets touched on during these trips, and every single bit of it lifts my spirits. I was born here and have spent most of my life in Montréal, and I still fall in love with this city over and over again at least a couple of times a year. My ability to do my job flows directly from that love. Like any entity, human or geographic, Montréal has its detractors, and I’m here to protect it, to make sure that they don’t hurt the city too much. It ends up being damage control a lot of the time. And when you consider the city, provincial, and federal politics that go on here … well, you understand why what I do is so vital.